James Purves was born at Berwick-on-Tweed on 25 May 1813 and arrived in Van Diemens Land in 1837, moving across to Phillip in 1839. He commenced practising as an architect and building surveyor that year with an office in Bourke Street opposite Mr Allan’s (whoever he was). He obtained an auctioneers license in the same year- possibly that’s where he met Welsh? A different address is given for his office- Little Collins Street, next to McLeans store; then another notice that he moved into McLeans store itself. Either way, he is located in the commercial centre of town. He sold the auctioneers business to H. H. Atkinson in 1841, and maintained another architect office in Collins Street from 1840. His private residence was in Newtown (now Fitzroy) in 1840, then Richmond in 1844 and 1845. He married Caroline, the daughter of Thomas Guillod of London in October 1842. His son, James Liddell Purves, who was a barrister, columnist, free trade parliamentarian and member of the Australian Natives Association, was born in Swanston Street in 1843. There’s his son. A fine upstanding man he is too. James Purves Snr. is listed as holding land with Chirnside at the Loddon River and Geelong in 1840, then took a license to run stock in the Portland Bay district with Chisholm in 1842-3 (but I doubt if it is John Moffat Chisholm, who seems to have always used all three names; there are other Chisholms in Port Phillip) . He also held land in Western Port with Dixon 1842-3; and with E. W. Hobson. He won a prize for a horse at the first show, held on 3 March 1842 at the cattlemarket on the corner of Elizabeth and Victoria streets- a “failure” of a show, according to Garryowen, where “the exhibits were a vast disappointment”. There is no evidence of much connection with the other Twelve Apostles. He seems to be quite active in leasing or purchasing properties in the early 1840s, especially during 1842 when the depression was kicking in, but there does not seem to be any further action after cutting his partnerships in 1843. Unlike the other Twelve Apostles, he had a profession to fall back on- perhaps this saved him from the insolvency that engulfed the others. He joined with Fawkner and Chisholm in fighting the arrangements made to cover Rucker’s debt once it all went pear-shaped. In September 1846 he helped fight a fire in a coach factory. By 1850 he was purchasing land again. He had a licence at Tootgarook- or is it Toolgaroop?- between 1850-69 where he became an importer and racehorse breeder and also at Traralgon between June 1853 and 1855. He obviously had the money to send his son ‘home’ to England for his education, his law degree and his Grand Tour. His son published the diary he wrote on the way home – A Young Australian’s Log. I wonder if that gives any more information? This is all so disjointed. There’s a Thomas and Henry Purves in Port Phillip at the time, who DO come out very strongly in Judge Willis’ favour, but I don’t know if they’re connected to James Purves at all. There’s several mentions of Mr Purves in the newspaper, but I’m not sure which one it is. And how and why did James Purves get involved in the Rucker scheme? Search me. Ah, now THIS Port Phillip Apostle seems well connected with some of the other ones. As you’ll remember, I’m trying to work out the connections between this group of 12 men who agreed to become liable “jointly and severally” for the debts of one of their number, W. F. A. Rucker. I’ve been surprised so far by how most of them had traceable connections with only one or two of the other men, which seemed strange given that they were throwing their lot altogether. But, unlike the others, our John Moffat Chisholm seems to have links with several of them. He was born in Edinburgh, Scotland (no date) and arrived in Melbourne in 1838 and set up business quickly as a merchant. He married a Miss Osbourne in 1838, and purchased ‘Maryvale’ at Moonee Ponds in 1841. His business was located in Collins Street, but in 1839 was burnt down. Garryowen hints at ‘mysterious gossip’ over the origin of the fire. He was well insured, and rebuilt on the same frontage. He joined with the other drapers in February 1841 to announce their agreement to their shop-assistants’ demands to close by 8.00p.m. except on Saturday nights. He also made an appearance as employer when he took his servant to the Police Court, presided over by the police magistrate St John, over forfeited wages, and as was common at the time he handed the proceeds over to the hospital building fund. The Master and Servants legislation of the time, which initially was used mainly against employees when times were good, worked more to the advantage of employees once the depression started to bite. In April 1841 he sold his business to C. Williamson, then moved his office a month later to Hind and Co. In January 1842 he bought land at a forced sale in Bourke Street at the very cheap price of 4 guineas per foot. He fell victim to the “swindler” Barrett who was execrated by many for skipping off to New Zealand rather than face his creditors. He also had a property somewhere along the Plenty River where the Plenty Valley bushrangers moved freely, terrorizing the settlers in April 1842, but the exact location has not been determined. He attended Debating Society meetings, where he signed a letter of support for George Arden when he was facing Judge Willis over libel charges. He posted bail for H.N. Carrington when he, too,was confined to ‘the rules’ on Willis’ orders but when he found that Carrington was intending to break bail to travel to Sydney, he and his fellow guarantor Peers surrendered their bail, no doubt anxious that they were going to have to pay the penalty. So here’s a connection with one of the Twelve Apostles- Carrington. He was on the Committee of Management of the Mechanics Institute, and here we see a further strand of connections with other Twelve Apostles. William Highett, who was fundamental to Rucker’s arrangement with the bank, was the Treasurer of this organisation, and Alexander McKillop and P.W. Welsh were fellow committee men and, more significantly, fellow Twelve Apostles. He appeared in court, along with Fawkner and Purves as part of the court cases that fell out of the arrangement with Rucker in February 1843. The other Apostles seem to have submitted quietly to their fates. So what happened to John Moffat Chisholm for the rest of his life, I wonder? He was obviously in Melbourne in 1872 to have his photograph taken by T. F. Chuck, and he died in Melbourne in 1874. So, I’m really none the wiser. He seemed to have social connections with Carrington, McKillop and Welsh. He resisted the fallout from the Rucker arrangement, but had to declare himself insolvent in any event. He must have recovered financially enough by 1845 to recommence business, and he breathed his last in Melbourne. The blurbs on the back of this book led me to think that I would be reading a crime novel,or a thriller but I don’t really think that it was either of these things. The book is strung together by an unnamed narrator, who nurses a long-held hatred of her sister, Yuriko who was acclaimed for her beauty. After a separation during adolescence, the younger sister returned to Japan and attended the same exclusive high-achieving high school as the narrator. The story is then taken up by the sister, Yuriko who instead tells us that the narrator is a needy, manipulative woman, undercutting the authority of the narrator’s telling completely. The two sisters’ stories are interspersed with the ‘journals’ of school friend Kazue, and the male Chinese refugee accused of murdering both Yuriko and Kazue. They are only loosely termed ‘journals’ as they include direct speech and act mostly as a vehicle for the author to present yet other perspectives. So who done it? Stuffed if I know. All these voices are deceptive and manipulative. The book is rather sordid- both Yuriko and Kazue work as prostitutes and the lives of all these people are grubby and joyless. There is much talk of beauty- Yuriko’s purported beauty; the beauty of bonsai; the beauty of intelligent youth that the school prides itself on nurturing- but it’s a putrid, cloying, trashy beauty. Perhaps I’m too old, or too Western for this book. Now what on earth is John Pascoe Fawkner doing here? He was probably Judge Willis’ most vocal supporter and yet here he is embroiled with some of Judge Willis’ most vocal opponents in the guise of H. N. Carrington and J. B. Were. The most plausible explanation that I can think of is that, given his propensity to be right in the thick of all things Melbourne, he became involved because other people were. Perhaps there’s a proprietorial element of protecting the civic reputation of “his” Port Phillip? Who knows? ?- but then again, there are many things that puzzle me about John Pascoe Fawkner- most of all, the nature of the connection between Judge Willis and John Pascoe Fawkner, a man who seemed to exemplify the things that Willis most strenuously derided. The two Johnnies- John Fawkner and John Batman have contested the title of “Founder of Melbourne” for about the past 100 years, and I notice that this year Capt Lancey nudged his way into contention as well. Bain Attwood has written a fantastic paper describing the creation of the “founding of Melbourne” narrative that saw Batman championed as the founding father by James Bonwick, only to have this status questioned in recent years and more prominence given to Fawkner instead. 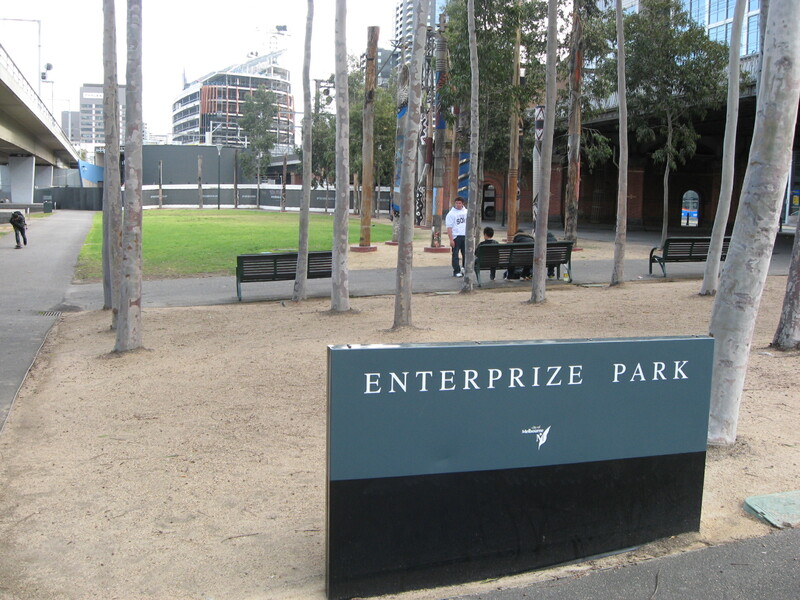 Attwood points particularly to the gradual disappearance of statues and commemorations to Batman and the increased visibility of Fawkner in the narrative, exemplified the recent creation of Enterprize Park (named for Fawkner’s ship The Enterprize) opposite the Immigration Museum beside the river. Fawkner fits well into Ville’s “ex-convict and emanicipist” category of entrepreneurs, with their attendant desire for legitimacy, esteem and recognition. He was the child of a convict and along with his free mother and sister, accompanied his father when he was transported for receiving stolen goods. They were among the group of convicts and free settlers sent with Lieutenant Collins to establish a settlement at Sorrento until the struggling community was abandoned for Hobart Town instead. John Pascoe Fawkner had his own brush with the law in 1814 when he was sentenced to 500 lashes and three years government labour for aiding and abetting the escape of seven convicts. He returned to Hobart in 1816 where he opened a bakery, but shifted to Launceston a few years later after further problems over selling shortweight loaves and using illegal weights. In Launceston he began anew as a builder and sawyer, then after some problems on character grounds in gaining a licence, opened a hotel and started the Launceston Advertiser newspaper. Hearing positive reports of the coastal areas of Port Phillip, just across Bass Strait, he engaged a boat and launched an expedition of the area. Well, that was the intention at least. When the captain, John Lancey learned that he had violated a restraining order imposed on him because of debt, the ship turned back and deposited John Pascoe Fawkner back onto Van Diemen’s Land territory and sailed off without him. Fawkner finally set foot on Port Phillip some two months later in October 1835, where he established a hotel, newspaper and bookselling and stationery shop. At the first government land auctions he purchased 92 pounds worth of land. At the 1839 land sale he purchased 780 acres along the Sydney Road for 1950 pounds. Within a fortnight he advertised that the land was available for tenant farms with seed provided, or a total of 85 acres for sale at 10 pounds an acre. He confided to the Reverend Waterfield that he had gathered 20,000 pounds in four years. He became a squatter in 1844, taking up a licence for 12,800 acres near Mt Macedon. He obviously wasn’t always flush with cash, because in 1841 he approached Montgomery, the Crown Solicitor, as guarantor for a loan to assist his friends Kerr and Holmes to purchase the newspaper and stationery businesses from him. The money made available to him came from the funds of Judge Willis himself, who had placed his money in Montgomery’s hands for investment. While this investment was, indeed, through a third party, and although Fawkner no longer owned (but did continue to contribute to) The Port Phillip Patriot, the paper’s unfailing and strident support for Judge Willis is notable. had helped to melt many a piece of worthless paper under the sunny side of the bank screw, so upon a crusade he goes, and by dint of cajoling he did succeed in effecting an arrangement whereby ten or eleven persons bound themselves to pay Mr F. A. Rucker’s debts. But John Pascoe Fawkner was not to be kept down for long. He retained his Pascoe Vale properties through a settlement on his wife, and his interest in the Patriot was signed over to his father. He discharged his insolvency quickly and used his wife’s property settlement as a qualification to stand for a vacancy on the Town Council in 1845, a position he had had to relinquish when declared bankrupt. He went on to serve for many years on the Legislative Council and died “the grand old man of contemporary Victoria” in 1869. One comfort I have which the falsely proud can never achieve, viz, I have not sunk below, but on the contrary, have raised myself above the rank in which at finding myself of years of discretion I was placed in, and I glory that I have thus passed them. Both Willis and Fawkner took pleasure in “hunting high game”. And both Fawkner and Willis seemed to exhibit a similar hot temper and vindictiveness that, at a stretch, might explain why such an otherwise mis-matched couple of men often acted as each other’s supporter. C.P. Billot The Life and Times of John Pascoe Fawkner. Thwarted again by the curse of the historian- dying on the job, so to speak. I seem to have run into a bit of this lately. “This wonderful book might never have been published had it not been for a chance comment by the Law Society of Tasmania’s former librarian, Mrs Kate Ramsay. The death of Professor Alex Castles in 2003 prompted her expression of regret that we had never published his work. That remark sent me rummaging through the Society’s basement archives, where the part-completed manuscript was eventually discovered. And not long ago, I read Donald Horne’s memoir Dying. The book was in three sections. In the first, he described from his side of the oxygen mask, the experience of dying from lung disease. His narrative falls silent, and is taken up in the second section by his wife Myfanwy. The final section of the book consists of a collection of incomplete essays that he had not finished writing when he became too ill to continue. On one level they are complete, self-contained works, but there is a fuzziness and hesitation about their conclusions that I think he would have tightened had he worked them up to publication standard. It seems that the act of publication in itself acts as a fixative and stiffener to one’s ideas- that you only really know what you think once you’ve taken another reader or listener through your argument and have enough confidence in what you have written to endorse it under your name. Another exposure I’ve had to a posthumous work is one step further back than this. The State Library of Victoria holds the research notes for David Scoullar’s Ph D on public performance in Melbourne 1839-1851. The catalogue record shows that “Mr Scoullar died before he could complete this doctoral thesis” in 1995. It’s a strange thing to look through someone else’s incomplete thesis. It’s arranged by chapter into coloured manilla envelopes. The chapters are in draft form, and you can see him pruning here, adding there but, as with Donald Horne’s work, there is a tentativeness about it as he’s working towards his larger themes. I know nothing else about him other than this work, but feel grateful that someone recognized its importance to him enough to make it available to other researchers. It will live on, incomplete though it is and despite the difficulties of citation, in footnotes and bibliographies of other people’s work. And, sobered by this reminder of mortality, I shall read on….. This is an old one from Spring 2008, but you know what I mean- those glossy little publications from your favourite bookstore with all the latest products, short blurbs and some breathlessly enthusiastic recommendations from staff with names like “James” and “Rosie”. What suckers are we: actually SIGNING UP to receive advertising! How much does one have to pay, I wonder, to have one’s book featured in this little freebie that keen readers actually ASK to receive? Still, I do like to see what’s around and tuck it away in the I’d-like-to-read-that-someday part of my brain. Just occasionally I marvel at the fact that “James” and “Rosie” manage to read such current books that- well, look at that!- just happen to be advertised in the same little publication, but hey- they work in a bookshop. But I was impressed that “Nigel” in this recent brochure nominated Geraldine Brooks’ “Foreign Correspondence” as his favourite book of the year- a book that was published in 1998 and much enjoyed by the ladies-at-bookgroup. Or, I wonder suspiciously, has it been re-released? Now, here’s a name that distinguishes itself from the other Twelve Apostles’ names by virtue of his strong Jewish associations. Abraham Abrahams was a merchant, along with Rucker, Were and Welsh, so it is perhaps to be expected that he might have been caught up in the financial syndicate that Rucker formed to rescue himself from insolvency and disgrace. But given that there were several Jewish merchants in Melbourne at the time (Michael Cashmore, and the Hart brothers spring to mind), it is strange that Abrahams is acting alone here. So what do I know of Abraham Abrahams? He was born at Sheerness, Kent in 1813. [update: maybe not- see comments below!] He arrived in Sydney with his wife and seven children in 1839 at the age of 26 (fast work there!) and was in Melbourne by 1841. He was described as a “merchant” of Lonsdale Street in 1841 when he donated the land for the first Jewish cemetery on what Garryowen described in 1888 as “a stony rise at the Merri Creek between the now Northcote and Merri Creek bridges”. The land was found to be unsuitable for burial- the poor sexton dispatched to dig the first grave “found himself working on what nature designed for a quarry and made little or no progress downward” (Finn p. 695). The grave was only half-dug when the burial party arrived to bury 19 year old Miss Davis, the young daughter of a Melbourne innkeeper, and in any event it was not her final resting place, as the body was exhumed and sent to Hobart. Realizing that all subsequent funerals would face the same problem, the Jewish community applied for land adjoining the general cemetery, and after a delay, their application was granted. In September of 1841, Abraham Abrahams was admitted to the Chamber of Commerce. Paul de Serville mentions that a “Mr Abraham” served as one of the stewards of the alternative public ball set up in opposition to the more exclusive private Turf Day ball in May 1841. The battle of the balls exemplified the attempt of “good society” to define its boundaries by limiting attendance to the ball to those deemed suitable. In defiance, a public ball was championed by the Gazette and Patriot newspapers who jeered the pretensions of the Turf Club stewards. The “public” ball was held at the end of May 1841, but was apparently not a success. The more “respectable” stewards eschewed any involvement with it, and on the night, rain kept many guests away (including perhaps those who were looking for an excuse to extricate themselves). Mr Abraham, however, remained as a steward but I am not absolutely sure that this is Abraham Abrahams. On 7 March 1842 he was appointed Trustee to the estate of the Langhorne Bros, even though at the time his debts amounted to 3792 pounds while his assets were 3655 pounds. By January 1843 he was listed as insolvent and shifted to Sydney. Abraham Abrahams served on both general and special juries, alongside other Twelve Apostles. He publicly supported Judge Willis in March 1842, but did not sign the petition circulated in November 1842, and was resident in Sydney by the time that Judge Willis was dismissed in 1843. Generally, Jewish citizens in Port Phillip publicly supported Judge Willis throughout. So why and how did he get involved in the Twelve Apostles arrangement? Hard to say. As a merchant and through his involvement with the Chamber of Commerce, he would have come into contact with several of them socially. If he was the Mr Abraham who served as a steward at the Public Ball, then this suggests some element of social visibility, and his jury duty and philanthropic gesture with the land donation indicates a level of civic involvement. Ah, but who can tell. Anyway, all ended well. At some stage he moved to Adelaide where he founded the Executor, Trustee and Agency Co. of South Australia which he managed until 1891. He was one of the original members of the Society of Arts in South Australia, a Governor of the Public Library, the Art Gallery and the Museum there. He was described as “One of the most distinctive figures in Adelaide, a man most courteous in speech and courteous in manner”.